Will You Join the Saltation? Agile circus performers leaping and bounding in saltations and somersaults. Adam Forepaugh, a rival of Barnum, born into poverty showed remarkable resilience soaring to become a leading American circus entrepreneur during the 1860’s until his death from the flu epidemic in 1890. This inquiry bounded along as we leapt from word to word connected with the Latin root salire. We had begun our inquiry with resilience sometime ago when we considered adjectives that could be applied to Odysseus, the ultimate rebounder who springs back from every adversity placed before him. We wondered about the difference between persistence and resilience. On Friday we examined resilience once again reviewing the morphemes and thought about the Latin root salire to leap to bound. We then leapt into an inquiry to uncover all the other base elements that sallied forth from this productive root. We took a slight digression from our ‘salire‘ investigation to inquire into the possibility of <*-tion> as a suffix, posited by one student. We examined action and interruption as part of this evidence. The students, despite my misspelling of interruption (! ), discovered a new prefix <inter->. We, could have capered further searching for proof of <inter-> and while this would have been another interesting digression, we kept the focus on uncovering the other bases from ‘salire’. Saltation was interesting. The OED notes four senses; ‘leaping and bounding’ as in the entertaining example from The Pall Mall Gazette of, September, 1883: ‘It is not every flea… that is gifted with the power of saltation’ . ‘Saltation’ also has a sense of ‘abrupt movement or change’ and the OED cites Emerson, 1854 : ‘The number of successive saltations the nimble thought can make‘ . The word too has a geological meaning of leaping and bouncing as in particles of sand forming sand dunes (watch saltating gravel and sand here ) even the sense of the ‘pulsating, spurting forth of blood‘ . 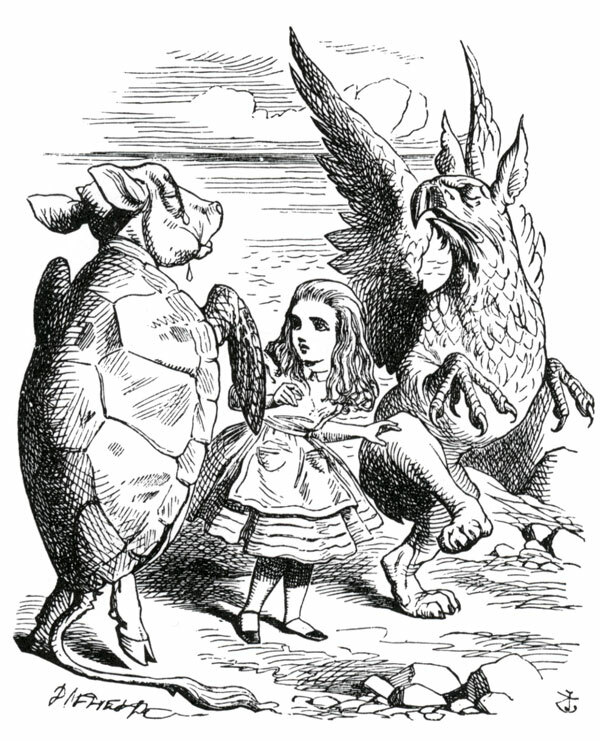 The Lobster Quadrille.The Mock Turtle and the Gryphon demonstrate the intricacies of The Lobster Quadrille to Alice. Illustration from John Tenniel, published in 1865. In a recent BBC interview in regard to his direction of Rutherford and Son, Miller spoke about acting in plays: “It’s no accident that the name of the game is ‘play’ and it has that sort of pretending people that you’re not. ‘Play’, pretending to be people that you’re not and yet who turn out to be people who might be”. ( BBC News Interview on directing at 79). This is precisely what Miller achieved in his Alice interpretation. These students had read Linda Sue Park’s novel A Long Walk to Water and were deeply moved by this and the documentary God Grew Tired of Us about the thousands of young boys, ‘The Lost Boys’ forced to flee across South Sudan. Salva Dut, the inspirational protagonist of Park’s biography embodies resilience. Salva at 11-years old, while in school was told to run when his teacher heard the sounds of guns. He and other students were told to hide and under no circumstances to return to their village. He became one of thousands of other young boys fleeing. We reflected on the word refugee, from Latin fugere to flee and saw just what this fleeing meant for young Sudanese. Salva reached the comparative safety of an Ethiopian refugee camp. However later, ‘as a teenager, was forced to flee once again. He led 1500 “Lost Boys” hundreds of miles through the Southern Sudan desert to the Kakuma refugee camp in Kenya. In 1966 Salva was relocated to the United States. Today he considers himself fortunate and wants to bring this sense of good fortune to the people of South Sudan. He now leads Water for South Sudan, Inc., the non-profit organization he founded in 2003. Drilling wells transforms lives and provides for the first time access to clean water. Once wells are drilled, schools follow and this transforms the lives of many, especially girls who no longer have to walk daily to find and carry water. So what have the students learned from this inquiry so far? Words come into English at different times, some directly from Latin others via a more circuitous root, some newer entries into English such as saute remain as yet unchanged. Bases canbe homographic- that is have the same spelling but different roots, such as the free base element <salt> and the bound base element <salt> as we’ve seen in saltation. Knowing the root and seeing the connection with current base elements and the resulting words flowing from this helps students to make conceptual connections between different areas of knowledge. In this brief inquiry we have discovered connections between physical education ( somersault- interesting combination of Provencal sobre and Latin salire) geology, dancing and medicine (saltation), cooking (saute) and psychology (resilience). Still more to discover- we shall dance on! So that’s it today from this Whiting, while not a graceful performer of saltations, is nevertheless always asking others to “Walk a little faster”! Read more about Miller’s Alice in Wonderland. Scroll down the entry on Topsy the Elephant to find two entertaining posters of the resilient, self promoting Forepaugh and his rival P.T.Barnum.